not many places serve sandwiches like lucky's. it's not that they are bigger than most other sandwiches you've ever had, it's that they're HUGE! especially when you add bacon and/or a fried egg to any of them! 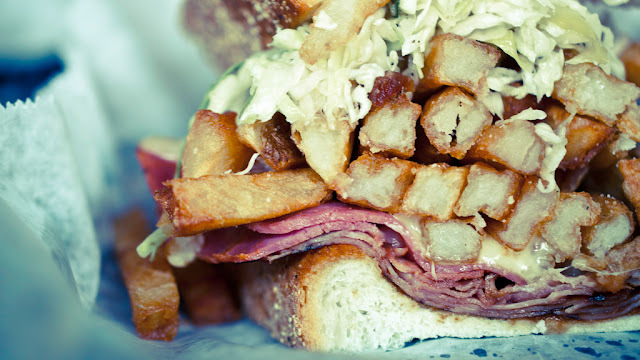 all sandwiches come "over-stuffed" with fries and coleslaw. the wings are great and the sandwiches are an experience. great place to go before or after a cubs game. oh, and if you haven't eaten in a month or so (plane wreck on an uninhabited island or something), try the lucky's challenge! The creative geniuses behind lucky's may have been the first human beings to understand the often strained relationship between the giant sandwich and french fries. "No one wants a crappy bag of chips with their gargantuan roast beef and cheese. They want FRIES! And furthermore, why should they be physically seperated from the sandwich!?!?" they asked, and the answer was HUGE! I love this place. The guys at Lucky's are truly dedicated to their craft, and showing up at ballgames early enough to be recipients of dozens of Bobblehead giveaways. Try the "Two Bagger", it made me love life again. Great job Cousins!